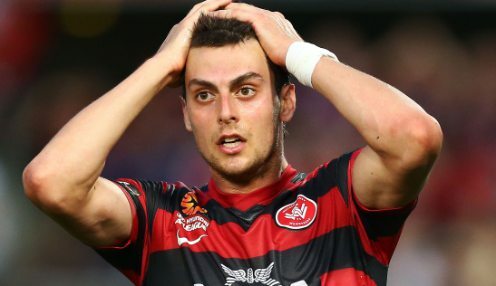 Socceroos striker Tomi Juric has turned down a huge contract offer from Chinese Super League side Shanghai Shenhua after taking advice from Australia coach Ange Postecoglou. Postecoglou echoed the views of Sydney FC star Sasa Ognenovski and former Adelaide United coach John Kosmina that a move to Europe would be better for the 23-year-old. Juric told Western Sydney Wanderers earlier in the season he wanted to move overseas, and said on going into the Socceroos pre-Asian Cup camp this month that his goal was to play in Europe. Shanghai offered him $10million over three years to move to China, with Wanderers standing to net an Australian record $2million from the deal. But the agent who was brokering the deal, Ante Alilovic, said Juric had had a change of heart after talking to Postecoglou. His U-turn came just before Thursday's deadline for him to sign for the Chinese club. It leaves him hoping for an offer from Europe, while Wanderers, who are 1/1 to win the Grand Final, will lose out on their potential to cash in on him if he does not move during the transfer window. Juric is out of contract at the end of this season and would be able to leave for nothing. He is free to talk to interested clubs as he is in the final six months of his current deal. Alilovic said: "Tomi had talks with Ange over his future and it may be that he told Tomi that he had to live and die by his decisions. "He told Tomi he picks his players on form but the feeling may also have been given to Tomi by Ange that he would improve more in Europe than China. If I was a national team coach I would have expressed that view. "Obviously the advice of the ex-Socceroos would also have had an influence. From Shenhua's point of view, they are disappointed because Tomi made a verbal commitment to join them a week ago and he has gone back on that." If Juric stays at Western Sydney, the club will only be able to play new signing Kerem Bulut in their Asian Champions League games as they do not have any room on their A-League roster. Wanderers are 1/1 to finish in the top six.